Since it opened in 1859, the Dime Savings Bank of Brooklyn has been integral to the history of the borough it calls home. True to its name, you could open a savings account with just a dime. The first person to make a deposit was a man named John Halsey who invested $50. Scores of Brooklynites followed suit, and by the end of the bank’s first business day, 90 people opened accounts; by the end of the first month, more than 1,000 people were depositing at Dime. But the bank cemented its prominent status in 1908 when the first subway tunnel between Manhattan and Brooklyn opened and Dime moved into its grand neo-classical building on Dekalb Avenue and Fleet Street. 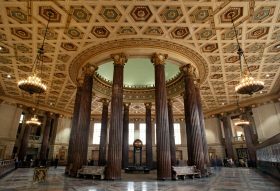 After the bank closed in 2002, the landmark still stood in all its former glory, operating as a special event space. Three years ago, JDS Development filed plans to build Brooklyn’s tallest tower adjacent to Dime, incorporating its Beaux-Arts interior as retail space for the project. And with work now underway, 6sqft recently got a behind-the-scenes tour of Dime Savings Bank with Open House New York. 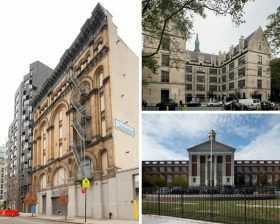 The city’s Landmarks Preservation Commission (LPC) on Tuesday officially designated three East Harlem buildings as individual landmarks, marking them as some of the neighborhood’s most culturally significant structures. The landmarks include a former 19th-century meatpacking house and two former public schools. The LPC chair, Meenakshi Srinivasan, said the buildings were designated for their architectural and cultural significance. “They embody East Harlem’s unique development history and recognize the civic institutions and businesses that helped shape the lives of the neighborhood’s immigrant groups,” Srinivasan said in a statement. 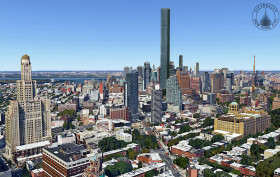 About a month ago we were treated to a lone rendering of Brooklyn’s future tallest tower at 340 Flatbush Avenue Extension (now re-dubbed 9 DeKalb Avenue) that showed its full 1,066-foot height, towering against the rest of Downtown Brooklyn. Now, Curbed has spotted a full set of views, these showing more facade details and close ups of the building’s triangular base next to the historic Dime Savings Bank. A little over a month ago, 6sqft learned that Brooklyn’s first 1,000+ foot tower, designed by SHoP Architects, would rise a whopping 1,066 feet, amounting to 556,164 square feet of total space. It all started back in 2014 when developers Michael Stern and Joe Chetrit purchased 340 Flatbush Avenue Extension (a five-story mid-century building that takes up about one third of the triangular site in Downtown Brooklyn) for $46 million with plans to demolish it. Then, in December, they closed on the adjacent Dime Savings Bank building for $90 million, providing 300,000 square feet of air rights needed to construct the 73-story tower. 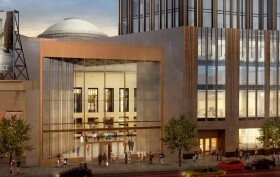 Less than a month ago, developers Michael Stern and Joe Chetrit closed on Downtown Brooklyn‘s Dime Savings Bank building for $90 million, which provided them with the 300,000 square feet of air rights needed to construct Brooklyn’s first 1,000+ foot tower at 340 Flatbush Avenue Extension. 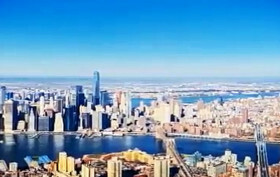 Since news of the future tallest building outside Manhattan first came to light in August, the exact height hadn’t been reported. But now NY Yimby has uncovered the number, and it’s a whopping 1,066 feet, amounting to 556,164 square feet of total space. It’s official, developers Michael Stern and Joe Chetrit have closed on the Dime Savings Bank building at 9 DeKalb Avenue in Downtown Brooklyn for $90 million, providing them with the air rights needed to build the borough’s tallest tower. According to Crain’s, who first broke the news, Stern and Chetrit will be able to transfer the bank building’s 300,000 square feet of unused development rights to the new structure’s site at 340 Flatbush Avenue Extension. 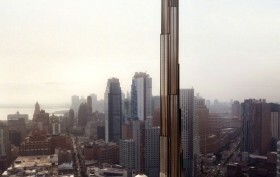 As 6sqft previously reported, the new tower will soar more than 1,000 feet and is being designed by SHoP Architects. It will also be the city’s tallest building outside of Manhattan when complete. 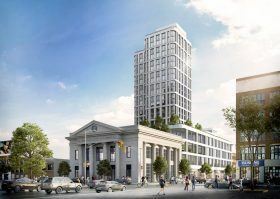 News broke back in August that Brooklyn’s first tower over 1,000 feet might rise in Downtown Brooklyn as the result of the $90 million acquisition of Brooklyn’s landmarked Dime Savings Bank building by JDS Development. Previously, they bought the site next door for $43 million, and combined with the bank’s 300,000 square feet of development rights, they acquired the means to build a tower of nearly 600,000 square feet at 340 Flatbush Avenue Extension. 6sqft got a taste of what’s to come when we revealed a video that showed the insane views from the top of the could-be tower, but now Yimby has unveiled the official renderings and specs for the project, which come courtesy of starchitects SHoP. 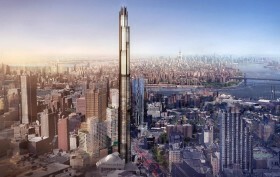 As previously speculated, it will reach 1,000 feet, making it the tallest building in the outer boroughs. The 90-story, vaguely Art Deco tower will have 466,000 square feet of residential space, amounting to 550 condo units, as well as 140,000 square feet of commercial space.